At the time of writing – early January 2019 – it is difficult to say whether the movement of the gilets jaunes has entered a phase of reflux before it dies down or if it is going through a pause after more than a month of intense activity and severe clashes with the state. Perhaps, however, it is possible to identify some of the characteristics of this "insurrection" – as some exaggerated commentaries describe it – of wide layers, but mainly the lower classes, of French society. In fact, it is beyond doubt that those who inspired the protest, gathering near the roundabouts, setting up road blocks at the most "strategically" sensitive points and the other initiatives of struggle, belong to the proletariat, and some of the impoverished petty bourgeoisie forced together – albeit in different ways – by the same crushing mechanisms of the capitalist mode of existence. The economic crisis which is the cause of their misery has only made the capitalists even more ruthless, if that is possible. This time, it was not the "banlieues", the decrepit suburbs of the big cities headed by Paris, with a high proletarian concentration, that are in revolt. It is the "people" – understood as the proletariat and the declassed or declining classes – of "Deep" France, the ones most affected by the cuts to certain social services (hospitals, schools, transport, public offices in general), as well as to wage cuts, which have been carried out by governments of all stripes, without respite in recent decades. It is no different here to everywhere else. "Normal" people, therefore, who find it hard to make ends meet, because their wage is too low, or because the umpteenth opening of a hypermarket drastically reduces the local shop’s customers. They dash around to get their children to school, because many local bus and train services have been suppressed, or have to take many kilometres more to reach the nearest hospital, since the smaller hospitals have been closed. It goes without saying that all this is the result of budgetary constraints, of austerity. An austerity, we might add, which has not "been imposed on us by Europe" in general, but by the European bourgeoisie in common accord, through their super-state (unfinished and precarious for as long as you like) called the European Union. Often these "people" are those who have rarely or never participated in peaceful trade union or political demonstrations, much less direct confrontations with the forces of the bourgeoisie. But the anger accumulated in the subsoil of society has suddenly exploded, following patterns which, as we have noted elsewhere, are not new in the history of the class struggle. Moreover, contrary to what most of the trade unions and some sectors of the "gauche", the more or less "radical" left are saying, but also the quasi-fascist "populism" represented by Le Pen1, which would like to put itself at the head of the gilets jaunes, the places in which the movement started and developed are not those where the Rassemblement National has found most electoral support, nor indeed does it appear that the popularity of our interior minister’s close ally2 has grown in recent polls. In short, it would seem that, until now, the movement is not at all dominated by the "populist" or nationalist right, but instead shows a healthy mistrust towards all the more or less institutional political formations, whose political representatives are thus obliged to keep their distance. Of course, given its shapeless, open nature, it goes without saying, that the interclass character of the movement, means anyone can try to slip inside it with a certain ease and the extreme right groups don’t hang back. Thus, according to some journalistic reports, the attempt to burn the prefecture of a small town was precisely down to the action of some neo-fascist militants. Just as it is not surprising to record racist and xenophobic voices on the pickets in the streets, or the massive presence of the tricolour, often accompanied by the Marseillaise, but from here to indiscriminately reduce the "people" who participate in the movement as irretrievably right wing, "populist" or based on "identity” is far off the mark. Indeed, if you tease out the claims that the gilets jaunes have sent to the press and to parliament3, there are several "points" that reject the actual policies of the "populists" when they were, or are, in government4, and were compelled by force to take back the empty promises they made in the election campaign. Fishing among the "points", one can find calls for a progressive income tax5, pensions at sixty and fifty-five for those who do strenuous jobs6, and a pension minimum of one thousand two hundred euros a month indexed to the cost of living. Just as an aside, this is the opposite of the measure passed by the Salvini-Di Maio duo in Italy, which rejects the indexation of pensions above 1520 euros gross per month. Getting back to the “points”, there is a demand for an increase in the minimum wage and wages in general, indexed to inflation, payment of a "French" salary (with related "rights") to those who work in France with contracts stipulated abroad.7 And again, regulation of precarious jobs, the reorganisation of energy services with the relative lowering of energy prices, the cancellation of cuts in social services and the extension of the latter with enhanced care services for the elderly, the disabled, and children, plus housing benefit, and help for students, etc are all demanded. There are also demands for protection of the environment, against climate change8 and, "even", for asylum seekers to be treated well, with French language courses for immigrants9, along with courses in the history of France, to accelerate integration: a step that could, of course, open the way to nationalism. It is true that these are all also typical demands of the petty bourgeoisie ruined by big, clearly reactionary, capital, in the sense that capital's mode of existence has never been stopped by legislation to protect small and very small businesses nor will it ever be10, but this is normal in a movement of "people", which is naturally socially diverse. A small part of those "doléances" do , however, stem from the needs of the proletariat which has been crushed and rejected by a bourgeoisie trying to manage a capitalist recession now more than ten years old. These spontaneous claims of the proletarian wing of the movement represents the economistic horizon of the proletariat, as it expresses itself in all its immediacy and spontaneity, and it cannot be otherwise. However, what for the proletariat is the spontaneous expression of its need to live, of an ineffable reaction to the attacks of capital – the indispensable starting point for an anti-capitalist perspective to find roots in the class – for radical reformism these are just political recipes to be applied at any time, regardless of the degree of response of the class. They are slogans for them to conquer (that’s their fantasy) economic-social spaces within a system in deep crisis that, therefore, not only cannot accommodate them, but if it does accept them it does so only partially and temporarily, just enough to bring the situation back under control, before taking back what has been given with interest. After all, the "doléances" are demands that are part of the political baggage of the radical-reformist world, headed by so-called rank-and-file trade unionism, which seems closer to the proletariat than that small nucleus of revolutionaries, who are marked by an abstract ideological method because they would reject the material needs of the proletariat with disdain (dismissing it as reformism). Apart from painting caricatures of these stupid revolutionaries, the point is not to disdain or refuse a substantial increase in wages and retirement at fifty-five – who would be so foolish to do so? – but to contrast the needs of the working class with those of the bourgeoisie in the appropriate way. That is, to give a perspective that starts from those immediate needs but which aims at the revolutionary overthrow of a system that repeatedly denies them. Macron, on the wave of a revolt, however limited – not a one-off strike proclaimed a few months beforehand! – has agreed to raise the minimum wage, has withdrawn the tax increase on fuel and pensions, raising the deficit (but only for this year, he says), taking into account the inevitable grumbling of the European Commission. However, to really trouble the French bourgeoisie (and not only them), the claims of the proletarian part of the yellow vests should have the active support of the class, not just its sympathy and moral support. This, although indispensable, would not be enough, because it would trigger a head-on collision with the State and all the political representatives of the bourgeoisie, including the "populists", of course. 1. Marine Le Pen is the chief executive, the head, of the Rassemblement National, the name taken by the Front National since 2018. 2. The reference is to Matteo Salvini, head of the Lega in Italy and ally of Le Pen. The Lega is in coalition with the other “populist” party, the Five Star Movement under Di Maio. 3. What this certainly indicates is inexperience, great ingenuity and political immaturity, elements that are inevitable, given the characteristics of the movement itself and of the historical phase in which we live. The list, in French, is reported in the article by Robert Dugot, France-debat. Les «cahiers de doléances» of «gilets jaunes», in alencontre.org. An Italian translation exists on the Sinistrainrete website. The cahiers de doléances were documents that collected the complaints expressed by every social stratum prepared for the Estates General, which opened on May 5, 1789, the first act of the Great Revolution. 4. In addition, we take it for granted, with the program of any government, not just those "sovereign". 5. In the face of the flat tax by Trump and Salvini, as well as the fiscal policies implemented by the governments for a few decades now, aimed at lightening, even in a consistent way, taxation on capital and large assets. 6. Masons and butchers are mentioned as an example. 7. It is a claim against the decline in wages, even drastic, to which sectors of immigrant workers are subjected and, consequently, also the indigenous labour force. To give a concrete example, in the shipyards of Monfalcone, some time ago there was the practice of paying workers from Eastern Europe or the Far East with salaries similar to those paid in their countries of origin, naturally much lower than those of Italy. We do not know if this infamous practice has been eliminated, but, we are instinctively skeptical about it. 8. Contrary to those who, in the early days of the protest, said that the yellow vests were "kidding" on the environment. 9. Which would be a common sense measure if we did not live under capitalism. 10. Among these, there is the aid to small-scale trade and the cessation of the opening of large hypermarkets, the protection of French industry, with the prohibition or the brake on relocation, the lowering of taxes on the small business, in addition to fuel, which affects hauliers and farmers. Despite the clashes with the police, there is also no demand to increase resources for the police, the administration of justice and the army. 11. From the Le monde diplomatique dossier of January 2019. Gilets jaunes: don't you find a little disturbing to hail French pigs? Thank you for this translation, one of the better politically-invested analyses I've read of the gilets jaunes movement so far. Just a note, footnote number 3 now reads: "What, this, without any indication of inexperience, great ingenuity and political immaturity" but this should read something like "What this certainly indicates is inexperience, great ingenuity and political immaturity" - the current sentence misses the verb "indice" (points to/indicates), and "senz'altro" means "certainly", not "without any". Thanks, it's now fixed. Glad you liked the article. Oh haha maybe also fix "yellow waistcoats" in footnote 8. With its overwhelmingly populist and nationalist dynamic, the "gilets jaunes" movement is predictably taking the democratic and electoral road to "solving the problems of the French" people, with national specifics but essentially along the same lines as Brexit: https://www.theguardian.com/world/2019/jan/24/gilets-jaunes-name-10-candidates-for-european-elections. The gilets jaunes have their reformist tendencies - like every other movement in history. And maybe nothing will come of it. But that in itself is not a reason to dismiss it out of hand, like the ICC and Mouvement Communiste do. Will these reformist tendencies guide the gilets jaunes towards parliamentary dead-ends? Possibly. But maybe the proletarian wing of the movement can open the way towards wider class struggles (for example, like this statement calls for) - to help with this, communists need to have a presence within the movement. So what does ''a presence within the movement'' and/or ''an intervention towards the movement'' entail in practice today given the small size and competing forces of today's revolutionary communist milieu? This was also interesting: "The situation in Toulouse was very different. 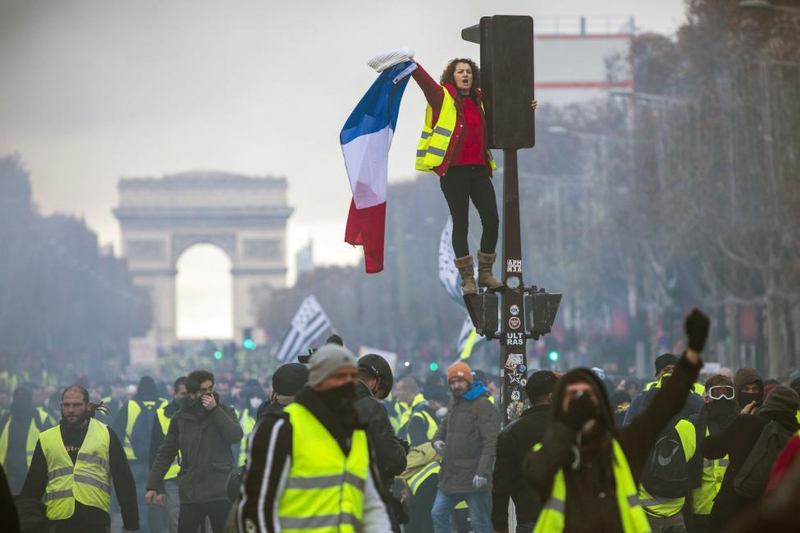 According to reports, the yellow vest movement remained strong and organized in this city and the surrounding region. The entire week before December 22, yellow vesters developed their actions, aiming to interrupt the economy as much as possible: they organized an illegal fireworks show entitled “yellow fever”” in downtown Toulouse; they blocked several toll collection points and let drivers pass for free; they blocked the trucks arriving and leaving several large retail logistics centers; at the Airbus site of Colomiers, they blocked the supply of provisions to a restaurant belonging to the Elior group to support employees who have been sentenced to pay back the equivalent of two years of their salaries to the group. There was a report over a week ago of YV protesters joining a strike in Paris but it doesn't seem to have come to anything. Socialist Worker has gone quiet again on the issue of the "gilets jaunes" as have many others that welcomed this movement as positive several months ago. Act XIV got underway at the weekend and the continuing violence was again a dominant feature. Protesters have lost eyes, hands and fingers along with some life-changing injuries resulting from attacks by the police. Intimidation of and attacks against anyone criticising the Yellow Vests has taken place by left wing elements and during the demonstration at the weekend a well-known Jewish philosopher was met with abuse by a group of YV protesters involving anti-Jewish sentiments and statements such as "this is France" (a recent poll found that over half of YV protesters thought that there was a global Jewish conspiracy). In Lyon a week ago (Telegraph, 10.2.19) left and right wing "gilets jaunes" fought each other in the streets with fists and weapons. Continuing with the theme of violence that has underlined events, one of the leaders, organisers and spokespeople of the YV, the racist Cristophe Chalencon, has been on Italian TV saying that he was in talks with "paramilitary" elements about taking organisation and the fight against Macron to another level. It may be bravado but these are the sort of individuals leading and directing this movement through social media. Another of the leaders, organisers and spokesperson of the movement, Benjamin Cauchy, ex-candidate for Sarkozy's UMP and close to the far-right UCODEL and Debout La France, said at the weekend that he wanted to break with the black bloc anarchists, his de facto auxillaries in the anti-Macron front (as right-wing thugs and elements of anarchism "cohered" during Maiden in Ukraine) and go back to the rural roundabouts and intersections. Here Cauchy can direct his thugs to the anti-foreigner check-points where wearing the Yellow Vests confers upon them the impunity to act as they see fit as good citizens of the French Republic. Cauchy reached a new low for the movement by adding that further "Acts" should take place on a Sunday where, in effect, the protesters could hide being women and infants and dare the police to attack them. Yellow isn't only the colour of custard; it's the colour of scabs and cowards. A more nuanced take on the yellow vests here: http://dialectical-delinquents.com/a-leaflet-for-a-yellow-vest-demo/ which should make a change from the incessant dogmatic black and white put-downs from Baboon, who mostly concentrates on the self-appointed yellow vest leaders when many yellow vests have rejected all representation. It's always easiest to present an image of coherence by reducing everything to only the obviously horrible aspects of this movement whilst omitting anything that contradicts this crude misrepresentation. There's a lot to attack in this confused movement, but it also attracts people who hate this society from a more radical angle, not that the sub-Leninist ICC's fellow traveller would be able to recognise the difference. The "gilets jaunes" movement has shown itself as an inter-classist movement without a perspective or, rather, a nationalist perspective with the aim of getting rid of Macron. It is not an expression of the proletariat but that of the development of the slow, painful despair of the petty-bourgeoisie. Certainly elements of the working class supported it in numbers and solidarity, but that has diminished as the nature of this movement has become clearer. The French bourgeoisie has exploited this despair and the violence of the movement which the state has done little to assuage with the assaults and provocations of its own legalised violence. There's already a significant material strengthening of the repressive apparatus of the French state. The latter has also sent a clear message that contestation will be met by state violence. The state has also used, not with much success apparently, the violence of some "gilets jaunes" elements in order to promote the idea of anti-fascism which goes hand-in-hand with the democratic state. The movement is slowing down and noticeably running out of steam and Macron has strengthened his position. That his "Great National Debate" is an outpouring of dreary waffle is not the point; the point is its democratic appearance. But the French bourgeoisie is far from in complete control of the populist developments. The unions, after a pause, tried to jump on the bandwagon and there was some convergence of some union manoeuvres with some actions of "gilets jaunes". But it's generally come to nothing. The unions have never denounced the brutality of the police and the CDFT and other, smaller, unions have supported the "Great National Debate". Where the unions and "gilets jaunes" have converged the workers involved face a de facto pincer movement with the nationalist "Yellow Vests" on one side and the nationalist trade unions, with the CGT at their head, on the other. Another attack on class consciousness comes from the idea that there is some sort of revolutionary or class struggle potential in the "gilets jaunes" movement. In this viewpoint an openly nationalist revolt of the French citizenry is amalgamated to the class struggle, whereas such a movement is poisonous for the autonomous struggle of the workers.